Asparagus – used to hate it, now I love it. 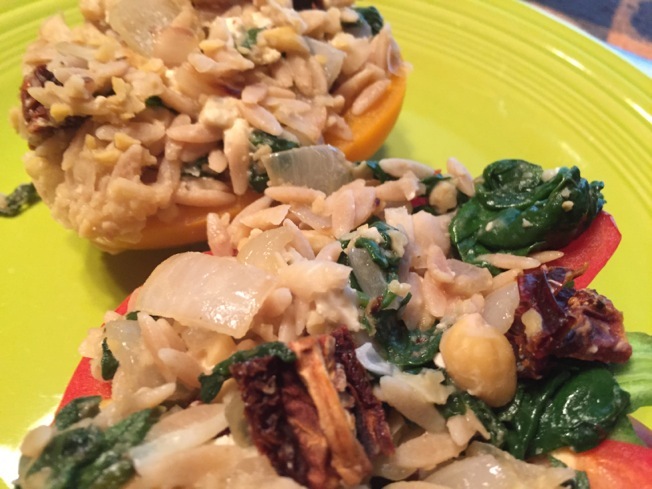 Spinach – used to hate it, now I love it. Fish – used to hate it, now I love it. Um….see a pattern here? I’m not alone that in many cases things that you first try out and don’t like, you come to like and even love. If you are a coffee fanatic, think of your first bitter sip. In a story on NPR, they looked at how that process happens to change an aversion into a preference. It often starts with some form of pressure to try and re-try an item. It could be your peers (have a cigarette), a celebrity (eat this cereal packed with bran) or your parents (you’ll eat what is on your plate). Eventually the aversion, through repeated exposure, can lead to acceptance and then even a preference. Check out the article here. Peas and olives – used to hate them, now I still do! 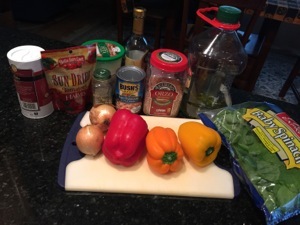 Most stuffed peppers I’ve had in the past were filled with ground meat. This is a great alternative. I used to abhor spinach, now I love it. 1. Halve peppers lengthwise through the stems, leaving the stems attached. Remove the seeds and white membrane. 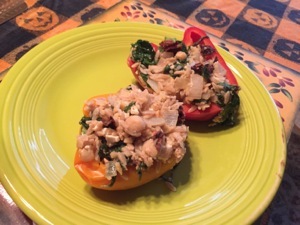 Place the peppers cut-side down in a large microwave-safe dish. 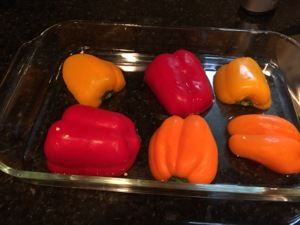 Add 1/2 inch water, cover and microwave on High until the peppers are just softened, 7 to 9 minutes. Let cool slightly, drain and set aside. 2. Meanwhile, bring a large saucepan of water to a boil. 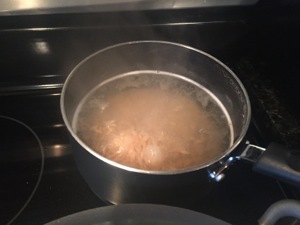 Add orzo and cook until just tender, 8 to 10 minutes or according to package directions. Drain and rinse with cold water. 3. 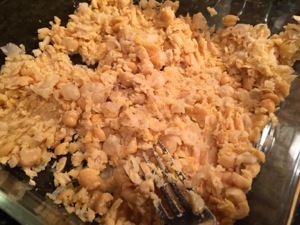 Mash chickpeas into a chunky paste with a fork, leaving some whole. 4. Heat oil in a large nonstick skillet over medium heat. 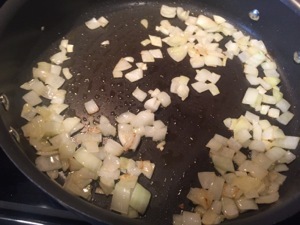 Add onion and cook, stirring, until soft, about 4 minutes. 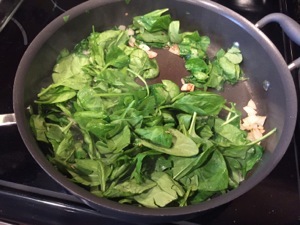 Add spinach and oregano and cook, stirring, until the spinach is wilted, about 1 minute. Stir in the orzo, chickpeas, 1/2 cup feta, tomatoes, vinegar and salt; cook until heated though, about 1 minute. 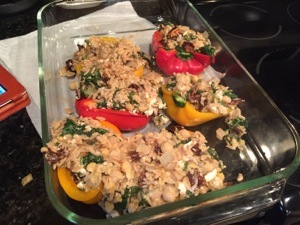 Divide the filling among the pepper halves and sprinkle each pepper with some of the remaining 1/4 cup feta. Nutritional Info: Per serving: 344 calories; 11 g fat (5 g sat, 4 g mono); 25 mg cholesterol; 48 g carbohydrates; 14 g protein; 11 g fiber; 656 mg sodium; 689 mg potassium.